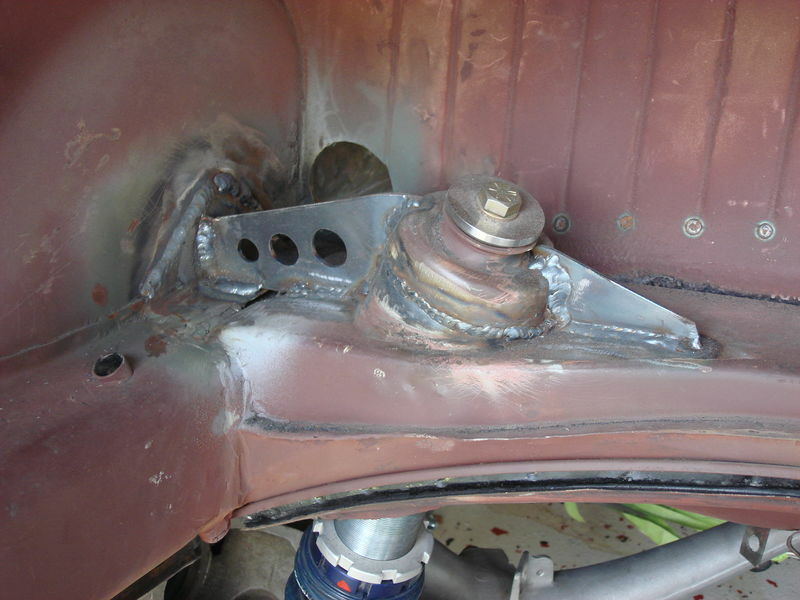 On a 1970 911, if you remove the torsion bars and replace with reverse coil overs and monoball suspension in the rear, how mandatory is reinforcing the shock towers? Noticeable handling difference, lose rigidity to the shell? Last edited by rrcrawford70s; 12-26-2017 at 01:24 PM..
As JSA mentioned, lots of threads on this here with opinions ranging from, "I've run rear coilovers for 20 years with zero reinforcing and it's been fine" all the way to "running rear coilovers requires a full roll cage tied to the front and rear shock mounts to support the chassis so it doesn't twist and bend where it wasn't designed to do so". Both sides of the opinion spectrum are fully represented, although the photo that JSA posted seems to be a pretty universally accepted "must do minimum" for rear coilovers. If you replace the torsion bars with coil springs, you'll need a complete cage that connects and triangulates all of the suspension pickup points, otherwise you get a flexy flyer and an unresponsive car. The main reason to use coilovers on a 911 is when you cannot get high enough spring rates with torsion bars. Getting proper droop travel on a rally car also calls for coils. Stiff indexed t-bars on cars seem to have a huge impact on one of the most importing things on gravel, droop. Also, I'd love to see someone instrument a car with String pots and the like to actually validate Steve's hypothesis.